So I wonder what are these forces? The water molecules move across the membrane due to thermal energy. 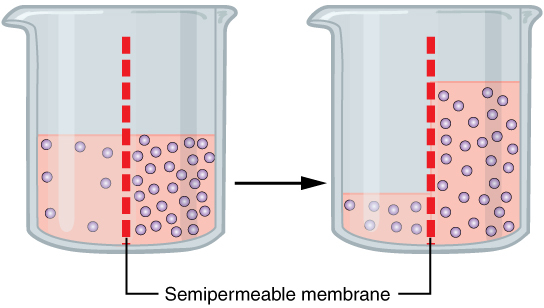 If concentration of solute on both sides of the membranes is the same, the amount of water crossing the membrane in either direction is same but when the concentration is unequal, the side with more solute particles (higher concentration, that is) attracts the water molecules and thus stopping them from going back. This process goes on until the particles cannot stop more water molecules from going back and equilibrium is achieved. Answering the question, the physical force that causes osmosis is the one that is responsible for dissolution of the solute in the given solvent which is (as others pointed out) electromagnetic in nature. If you dribble a basketball, the force of your hand on the ball, that keeps it bouncing, is not (1) gravity; (2) the weak force; or (3) the strong force. It must be electromagnetic force--the electrons in the molecules of your skin repelling the electrons in the molecules on the surface of the ball. Also, your skin and the ball remain (largely) intact because of the electromagnetic force that hold them together, respectively. Same for osmotic "force". The motions of the solute and solvent molecules are not governed meaningfully by anything other than electromagnetic force. Not the answer you're looking for? Browse other questions tagged intermolecular-forces osmosis or ask your own question. Why do molecules having a higher relative molecular mass have stronger inter-molecular forces? What other intermoelcular forces can exist between neutral molecules? How to illustrate London forces?